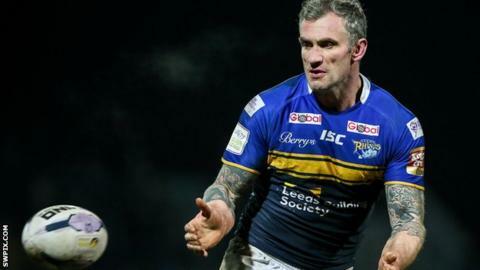 Leeds Rhinos maintain their lead at the top of Super League with a five-try victory over Salford Red Devils. Leeds held a four-point advantage at the break after two converted tries from Jamie Peacock and one for Ash Handley, with Lama Tasi and Niall Evalds replying for Salford. Rob Burrow then scored Leeds' fourth try, but Evalds reduced the deficit. Zak Hardaker's try on the hour, followed by Kevin Sinfield's fourth conversion, sealed the Rhinos' win. The wind was a significant factor in an entertaining first half, with Peacock the first to cross before two tries in four minutes saw Salford hit back as Tasi forced his way over and Evalds raced past the Leeds defence to touch down. Michael Dobson kicked both goals, but Leeds levelled as Peacock finished off Danny McGuire's grubber kick and Sinfield added to his earlier conversion. The Rhinos pulled ahead just before the break as a kick through caught in the wind and Handley eventually dived on it in the corner to make the score 16-12. Burrow finished off Joel Moon's break and Sinfield added the extras for Leeds to extend their lead, but Evalds collected a hopeful high kick to score Salford's third converted try to bring them back to only four points in arrears at 22-18. Hardaker's try followed a burst by Burrow and Sinfield's kick restored the 10-point advantage as Leeds earned their ninth win in 10 Super League games. Salford coach Iestyn Harris said: "Our effort was really good, as was the way we defended apart from conceding a disappointing try just before half-time. "We were a little naive with the ball but that can be down to a lot of forced personnel changes. We didn't quite have the fluency of Leeds which they had in key positions but we stuck with them for 80 minutes. "Maybe a year or so ago we would have been blown away in the second half against a very good Leeds side. We only had 17 players available but will have George Griffin back from Wakefield this week." Leeds coach Brian McDermott: "I wasn't really happy with what we delivered other than the result. "We got away with a few things but the conditions were crazy. The wind had a big bearing. We knew we would be a down on energy after Easter but it wasn't a terrible performance and we played a little care-free in the second half. "Jamie Peacock and Stevie Ward were massive, as was Ash Handley, and Zak Hardaker showed a lot of leadership qualities. But St Helens (Friday's opponents) won't be quaking in their boots the way we played." Salford: Evalds, Jones-Bishop, Caton-Brown, Sa'u, Johnson, Fages, Dobson, Taylor, Hood, Morley, Hansen, Walton, Forster. Replacements: Tasi for Morley (23), D. Griffin for Forster (25). Leeds: Hardaker, Handley, Ablett, Moon, Golding, McGuire, Burrow, Singleton, Aiton, Peacock, Achurch, S. Ward, Sinfield. Replacements: Cuthbertson for Singleton (21), Sutcliffe for Aiton (34), Delaney for Achurch (42).